Not unlike me, the old nurse log that rests on the edge of our southern pond seems to be getting lower to the ground and wider in the hips with each passing year. What used to be a round, high and solid surface is now soft, spongy and low enough to step over, even with my short legs. 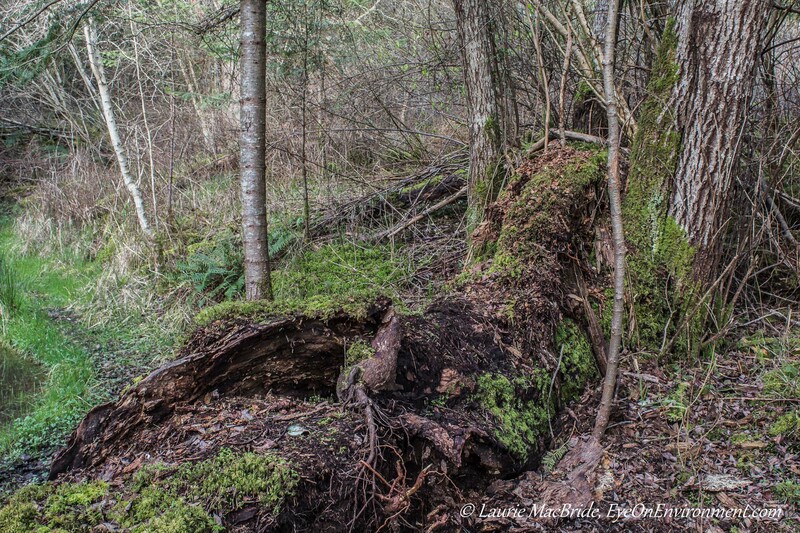 The nurse log supports a variety of colonizing mosses, and the roots of neighbouring firs, hawthorns and willows amble through it. Along its top surface, you can see hundreds – perhaps thousands – of small brown scaly objects: refuse from Squirrely’s meals, eaten on a fir branch overhead. To the side of the log, the bounty of discarded seed coats have formed deep middens which will eventually become substrate for new forest mosses, plants and trees. At its west end the decaying log nurtures a Pacific crabapple, whose branches lean awkwardly over the pond (not visible in the photo above, but you can see it here). Before very long, those branches will break off, changing the topography of the pond and starting on their own cycle of decay, renewal and growth. Posted by Laurie MacBride, Eye on Environment on January 28, 2016 in Forest, Musings on Life and tagged aging, environment, life, nature, photos, plants, squirrel middens, time, trees. The forest is a truly amazing place! Where’s your favorite forest walk? I love the boardwalk to Hot Springs Cove. Also East Sooke Park. And many others! Thanks for visiting the blog and commenting, Darcee. Hard to choose a favorite, but I do love walking at Drumbeg Park here on Gabriola. Further afield, the trail between Wiatt Bay and Small Inlet, on Quadra Island, is lovely too. And so many others! Yeah, somehow I have a hard time describing my personal aging process as interesting, or magnificent. LOL! I can relate, Charlie! Hah, isn’t that the truth?! Thanks for stopping by the blog and for commenting.